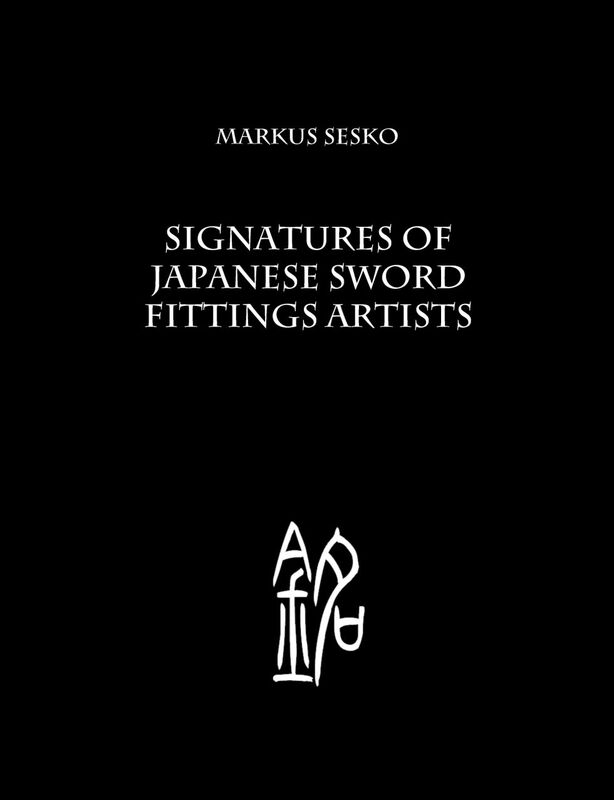 It turned out that the formatting did not take that much time and so I was able to finish my just previously announced latest publication Signatures of Japanese Sword Fittings Artists. My motivation for compiling this work was purely a service-oriented one. Over the years I have constantly received inquiries for authenticating signatures on sword fittings, or for advice as to whether a work/signature looks promising enough to be submitted to shinsa, a procedure which we all know needs some background work and takes time and money. Dealing with such inquiries is quite a sensitive task. First of all, you don´t have the item in hand. That means you have to decide on the basis of pictures alone if a signature and quality of a work justifies further research, providing that the pictures you receive are of decent enough quality. If so, you have to compare the signature with your reference, and for this I have compiled over the years a humble database of roughly 5,000 pictures of mei. As this was for my use only, and as I am fortunately able to read Japanese, I just labelled the pictures accordingly, i.e. I did not make any list with the names of the artists or translations of the signatures and the like. With this database as a reference I have so far been able to offer some signature comparisons which have been of much help in making some basic judgements. So, if a signature matches in syntax and the characteristic style is very close to an authentic signature from my database, then sending the piece to Japan for shinsa becomes a possibility. Or, if the inquiry was not about obtaining papers, the inquirer can be reassured that chances are now higher that his item is authentic. The greatest problem in compiling this publication was due to the quality of the pictures. Although over the years I have always scanned the pictures with the highest possible resolution and with a decent scanner, the main problem remaining was the often bad initial quality. In many cases signatures had been photographed and catalogued only once and then it was decades ago. After some test prints I had to immediately dismiss about a fifth of the pictures in my archive. Apart from that there are some pictures whose quality is really no better than those dismissed but for which I decided that they should remain in the publication. This concerns first and foremost signatures of artists of which hardly any signed works are known. On the other hand I also kept pictures where one is at least able to see the basic style, position, and arrangement; information which might also help sometimes in “judging” a signature. As for the structure of the book, the information provided for each artist is kept as simple as possible. That means, for reasons of space, all the necessary data is given which allows one to recognize an artist on which detailed information can then be found elsewhere in a next step. I also attached importance to quoting the signature shown, as if I had simply illustrated the pictures this publication would have been a “half-hearted” approach and would not have been that useful in the end. However, and again for reasons of space, only the basic and essential information of lengthy signatures is quoted. Specifically this means that dated signatures are just quoted as “dated 1858” for example, and sometimes the names of places and the like are omitted. In addition, and for the sake of searchability and recognisability, I also attached importance in quoting each name and gô with both the simplified and the un-simplified characters. Apart from that this publication should be self-explanatory. A list of all the characters from the names used by the featured artists is provided at the end. In this sense I hope that this work will serve the collector, dealer, and sword fittings enthusiast as a source of reference. Thank you for your attention and once again Happy Easter to everyone!